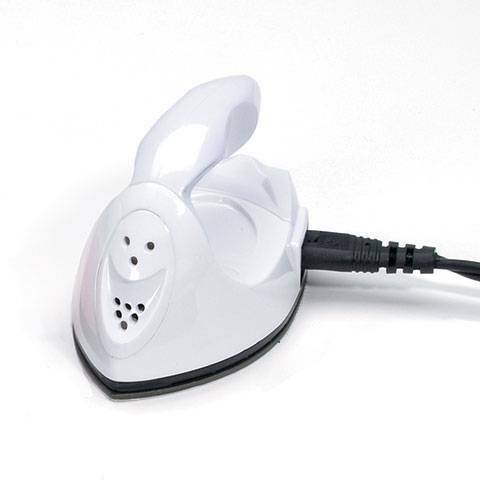 Iron heats up in just a few seconds and will get hot enough to remove creases so you can always have that fresh look! Great for sewing and quilting classes. Iron heats up in just a few seconds and will get hot enough to remove creases so you can always have that fresh look! Small enough to fit in the palm of your hand, the iron will fit easily into your purse or carry-on bag. Great for sewing and quilting classes. This has a UL E137398 electric cord. Iron features an "on" indicator light. Iron is light pink and white. Watt: 15. Volts: 110-240. Heater use: PTC. Not a toy. Intended for adult use only. Photo shows a pink iron, however you may receive a randomly selected pink, white, blue or red encased iron. All irons have a white handle. Please note that this item does not include a SA plug adapter, no transformer needed.